Character is the picture book element of the day for Christie Wright Wild’s PB 14:14 blog challenge. Maya, the star of Maya Was Grumpy, radiates character! The author, Courtney Pippin-Mathur, did an excellent job bringing this little girl to life through text and illustrations. 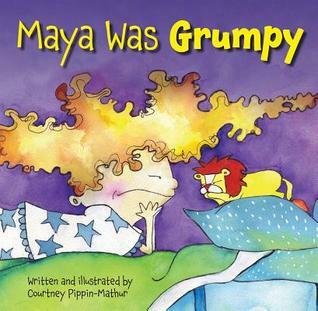 The first line simply reads, “Maya was grumpy.” The accompanying illustration shows a young girl with big, wild hair and a scowl on her face. So already, on page one, we get a strong sense of Character. She didn’t know why she was grumpy. She was just in a crispy, cranky, grumpy, grouchy mood. The story is awesome! I would tell you more details, but I really want you to read it. One thing I will tell you about though, because it is my absolute favorite part of the book, and probably what I would consider the strongest aspect of the book to show Character, is Maya’s hair. Her hair gives her character because her hair changes with her mood. It almost has a life of its own. It starts off big and wild, but as her mood gets worse, it gets even bigger and wilder. Then later, as her mood improves, it begins to shrink and by the end of the story, we see a sweet, happy little girl with two curly ponytails. We definitely get to know Maya and her personality through the wonderful text and super-colorful, super-amazing, full-page illustrations in Maya Was Grumpy! Thanks for sharing your review–I’d really like to read it now and I keep thinking about her hair. Imagine if our hair always telegraphed our moods? Maybe that wouldn’t be such a bad thing, then others would know when to leave us alone. ; ) This book is well worth the read. Thanks for commenting! Great selection for illustrating character! I love this book! Sooo cute! I just love Maya! I imagine every parent could relate to this little girl’s mood. Even her stuffed lion’s expression changes with the mood. This book sounds great! Can’t wait to pick it up and check it out. Love the use of language and the illustrations. Maya (and her hair) sounds like a great character. Thanks for another great analysis. I liked this book the first time I read it, but it wasn’t until I did the analysis for PB 14:14 that I realized how much. It’s really good! Thanks for commenting. I am checking out this book. I love the analysis. You did an awesome job. 😀 Wordplay is always amusing for me. This challenge is helping find books that I can learn from. Thanks for doing that. It is appreciated.